According to the defined agenda the project meeting started in the early morning at the first day of the meeting in the Volkshochschule Villach. In the meanwhile the learners did their first geocaching activities together with two trainers and one learner of the Volkshochschule, who also was leading one group. Altogether we had 3 groups of learners discovering the center of Villach by geocaching with 3 different roots and two quizzes about the historical monuments of Villach. In the afternoon the project partners and the learnerscould make the activities all together. In Warmbad Villach, also divided in 3 different groups with 3 different roots, we discovered other geocaches. In the evening the farewell event took place in the media library of the chamber of labour, near the Volkshochschule. 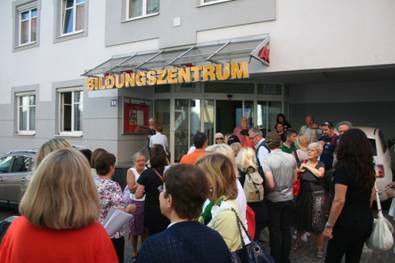 Politicians of the city of Villach and heads of the Volkshochschule welcomed the international guests and representatives of the government of Carinthia. The president of Università delle Liberetá of Udine, who was alsothe coordinator of the project, tookthe chance to speak about the other common European activity of the twin institutions (VHS and LiberEtà) in particular the common Leonardo mobility project, because some of the trainers of the Volkshochschule, who are taking part in that project, were there for attending at the farewell event of Outdoor ICT. One person of the staff, who is from the Agenda 21 of the municipality of Udine,even spoke about the cooperation of the city with the partners for this project. Subsequently the chapters of the booklet (the main result of the partnership) were showed and some of the learners and of the project partners gave their feedbacks about the work they haddone. On the 19thof Junein the surrounding of Landskron the activities started early with geocaching. 2 different groups discovered the natural beauty of Carinthia on 2 different roots (an easier and a more difficult one for the sporty people). On the top of Landskron we visited the castle and an eagle show. In the afternoon the activities finished with the last caches found near the lake. All the partners have to consider the final date of 30.09 to submit all the necessary documents for the end of the project at their national agency. The coordinator will take care of the common part of the report and send it to the partners, who can add their comments. Every partner has to fill in the national part by himself.